Coinvest is a regional platform that is building a relationship between high-tech startup companies and investors. 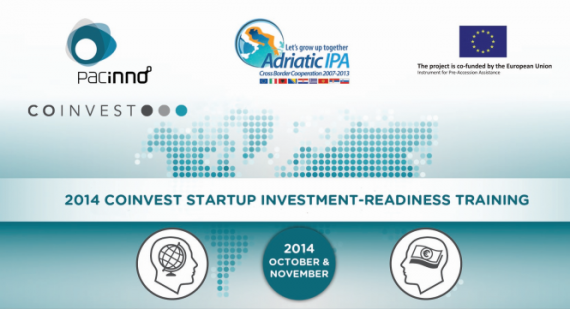 In October and November they organize Startup investment-readiness training for innovative projects from eight countries of the Adriatic region: Albania, Bosnia and Herzegovina, Croatia, Greece, Italy, Montenegro, Serbia and Slovenia. We invite all disruptive startups and projects to apply, as there will be ample opportunities to network with potential venture financers. All interested startups can apply here by 30th September and more details about the Call for projects can be found on their website. Coinvest is a part of Pacinno – Platform for trans-Academic Cooperation in Innovation, an international project funded by the IPA Adriatic Cross-border Cooperation Programme.